Almost every system in the world interacts with some other system so that stability is attained. Every phenomenon that occurs in nature is a result of energy exchanges between two or more systems. Whether it be the physical dynamics of motion or the chemical combination of two substances, the aim of the system components is always to lower their energy and become more stable. There is a constant excitation and de-excitation going on in all the systems of the universe. Same is the case with psychological phenomena- it all comes down to energy. 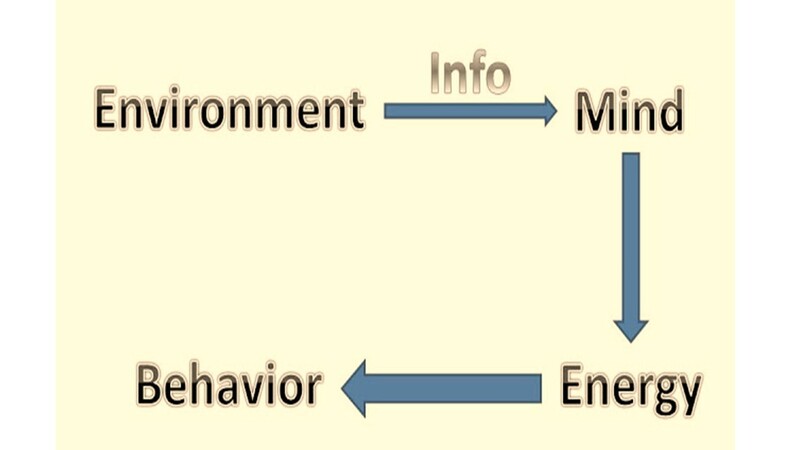 Our behavior, most of the time, is a direct result of the energy exchanges between us and our environment. What’s fascinating is that this ‘environment’ not only includes things outside of our body but also things that make up the body itself (organs). Your mind is watching over your bodily functions as much as it is monitoring the external environment. Heck, even the thoughts that you think are considered as 'environment' by the mind because it responds to them in a similar fashion as it does to the external environment. We receive energy from our external environment via the five senses. This energy (information) is processed by our mind and interpreted in a certain way. This interpretation often happens subconsciously, unless a person has raised his level of awareness, and the way we interpret this information determines what kind of emotions we experience and hence the actions that we take. 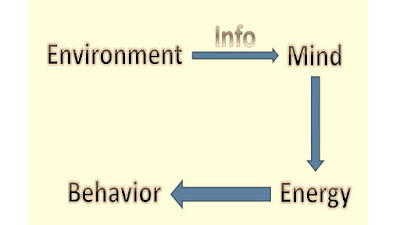 Like I said before, our mind also receives information from our internal environment i.e. our body and also from our thoughts. That explains why we feel the emotion of hunger and why even thoughts (and not just the circumstances) have got the power to trigger emotions. In the former case, our mind is warning us that our calories have depleted and, in the latter case, it is trying to make sense of the images that we are holding in our mind. If our mind 'considers' not only the external environment as its environment but also the what's going on in the body and our thoughts as its environment, where then is the mind located? No one knows. All we can do is measure its activity in the body, especially in the brain. Without going further into the mystery, we can be at least sure of the fact that our psychological phenomena are the result of the energy exchanges between our mind and our environment (both external and the so-called internal). In the post about emotions, I said that all emotions motivate us to perform actions. How do they do so? By providing us with extra energy. As soon as we take the actions, we are relieved of this extra energy and we attain stability. Our mind is basically an energy-generator that generates energy in the form of emotions. Do we always take action when a certain emotion is generated? The answer is an obvious no. There is a certain threshold up to which we can tolerate the extra energy that our mind generates. This threshold varies from person to person and from emotion to emotion. Once this threshold is reached, the extra energy of the emotions becomes unbearable and we are forced to take actions. When we get rid of the extra energy that our emotions charge us with, we become psychologically stable. That’s what we strive for; that’s the purpose most of the actions that we take throughout the day are designed to serve. While we are all always trying to achieve psychological stability, the truth is that we can’t fully attain it as long as we are interacting with our environment, that is to say, as long as we are alive. Yes, sometimes we may be more stable than at other times but 100% psychological stability can’t be attained as long as we are receiving information from the environment. When we feel hungry we eat food. Hunger provides us with the energy to go and look for some food. Once we do that, we became stable again. When someone who has a low self-esteem hates you or is jealous of you, his hatred makes him unstable and he feels like putting you down. By criticizing you or gossiping about you, he eases his emotions a bit and becomes stable. If someone violates your rights or treats you unfairly, you become angry. Anger charges you with energy to motivate you to take your rights back and seek fair treatment. When you do that you become stable. When we have dreams and goals, the thoughts of fulfilling them motivate us greatly. This motivation is simply our mind providing us with energy so that we may be able to take the actions required to achieve them. Once we achieve them we become stable, until we find new goals to chase.